Question of the Week: Who Am I Cheering for in the Italian Elections? This is an easy question and a hard question. 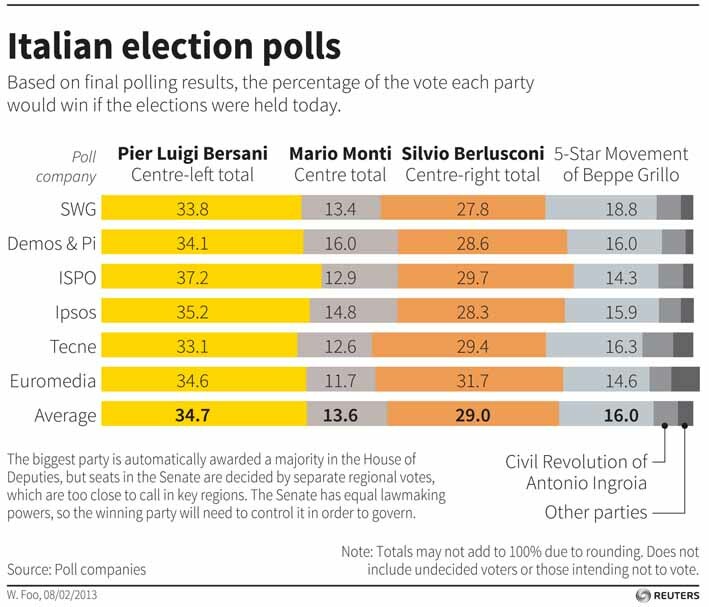 After all, voters in Italy have four horrible choices. Silvio Berlusconi, who is an Italian version of George W. Bush. He’ll occasionally dish out some good rhetoric and promise tax relief, but he’s shown zero desire to reduce the burden of government spending and intervention. Mario Monti, an apparatchik who is first and foremost a creature of the calcified bureaucracy in Brussels. He would be a sober hand on the helm, but seems content that the ship is heading in the wrong direction. He’s sort of the Mitt Romney of Italy. Beppe Grillo, a comedian/entertainer/blogger who has a populist (albeit incoherent) agenda. He’s a strange cross of Jesse Ventura, Arnold Schwarzenegger, Ross Perot, and Bernie Sanders, so don’t even think about that petri dish. Pier Luigi Bersani, a run-of-the-mill social democrat who started his political life in the Communist Party but now is best described as a career politician who wants to preserve the status quo of statism. Sort of the Harry Reid of Italy. So far as I’m aware, there is no good political party in Italy. Classical liberals, conservatives, and libertarians seem to be endangered species. That’s why I answered none-of-the-above. But what if my kids were being held hostage and I had to choose from this unpalatable quartet? Go ahead and shoot them…no, just kidding. Let’s see, what should I do…? Part of me wants to cheer for a Bersani-Monti coalition government for the same reason that I wanted Hollande to win in France. When there’s no good alternative, let the above-board statists prevail so there’s hope of a backlash when things fall apart. And if the polling data is accurate, that’s probably going to happen. But part of me wants Grillo to do well just for the entertainment value. And maybe he would blow up the current system, which unquestionably has failed, though one wonders whether any system will work now that a majority of Italians are riding in the wagon of government dependency. Indeed, it’s a bit of serendipity that a former Cato intern who came from Italy drew this famous set of cartoons about the rise and fall of the welfare state. While I’m largely uncertain about what should happen in this election, let me close with a few thoughts on public policy in Italy. In particular, I want to disagree with some of my right-leaning friends who argue that the euro should be blamed for Italy’s woes. I’m not a fan of the single currency, largely because it is part of the overall euro-federalist campaign to create a Brussels-based superstate. That being said, the euro has been a good thing for Italy and other Club Med nations. As I explained last July, it means that countries such as Italy, Spain, and Greece can’t augment the damage of bad fiscal and regulatory policy with inflationary monetary policy. In other words, it is good news that Italy can’t use inflation as a temporary narcotic to offset the pain caused by too much red tape and an excessive burden of government spending. This doesn’t mean that politicians will ever choose the right approach of free markets and small government, but at least there’s a 2 percent chance of that happening if they stay with the euro. If Italy goes back to the lira, the odds of good reform drop to .00003 percent. But watch how european lemmings will blame Italy’s election result for the systemic low motivation of five hundred million Europeans living under welfare state incentives — and the continental decline that becomes inevitable under relentlessly compounding subpar growth rates. I think that the future successful people of the planet — the new mobile citizens who will work like economic mercenaries for any one electorate lets them keep their reward –are learning important behavioral lessons: “Don’t wait until things get to the Italian point. At the first sign of entrance into the vicious cycle of prosperity through redistribution, pack up and leave for greener pastures”. If it weren’t for insights such as this, I wouldn’t be reading this blog. You’re way ahead of British “conservatives” who think that the trouble with the euro is that the Club Med can’t devalue its way to prosperity. But I have to disagree on Berlusconi: you have been deceived by the “right-wing” label. The closest comparison is not GWB but George Soros. Perhaps you are not aware that Berlusconi was closely associated with the Italian Socialist Party while he got rich. It’s only after the Socialist Party was disgraced that B. reinvented himself as a man “of the right” …purely for marketing purposes: there was no major party labeling itself “of the right”, so that was where he was going to get votes! Soros might do the same if the Democratic Party were disgraced, except that he is too old to play these games. Italy is on an anemic growth trendline to extinction. And by that I do not mean the current growth, which is negative. That is rather temporary and will pass. I mean the one to two percent annual growth trendline that Italy salivates to achieve if all goes “well”. A one percent growth trendline has a definitive destination: Decline and extinction. As I have said many times, a one percent annual growth trendline in a world that is growing by five has an obvious simple arithmetic outcome: DECLINE. On a one percent growth trendline, four relentlessly compounding points behind the world average, NOTHING is sustainable. Attempts to insulate the majority from the consequences of mediocrity through persecution of exceptionalism does not provide nearly the motivation needed to keep up in the global marketplace. Italy will continue to decline, its downward spiral compounding ever deeper with every passing year. But look and learn because as the US is entering the same vicious cycle of decline, on an individual basis, the survival skills learned in the Italian environment will become essential. The economic distress of lower US growth will prompt the voter-lemmings to the predictable pavlovian reaction of more government “help”. The decline cycle will deepen. Like many other voter-lemmings before them, Americans will commit the same suicide. Different colors, different slogans, different hopes to different perpetual motion machines,… but essentially the same suicide. P.S. I think that the wagon cartoon is good, but still misleading. It shows a good life in the wagon. Life is tolerable on the wagon, …in the beginning. But as more and more people ride it, conditions worsen, the speed drops, growth rate starts falling further and further behind the world average, compounding the wagon into decline. Meanwhile, the sedentary life of the wagon weakens the riders to the point that jumping off and pulling is out of the question. They stay in the decrepit conditions of the wagon. Occasionally one jumps off, gets trashed by the disproportionate effort in front and returns to the wagon to tell the others “Don’t even try it. It ain’t woth it. You will fail”. This is how it ends. And so the Italian majority, living in their east german like appartments, ride into the sunset of decline… That’s HopNChange folks…. By the time it gets too hot it will be too late for the American frogs to jump out of the pot. on February 24, 2013 at 10:52 pm Thomas J. Lucente Jr. I voted for Berlusconi, not because I love his politics, but because I love his antics. Probably not a responsible way to vote, but, as you pointed out, the options were limited. As for a classical liberal party, the Stop the Decline party, headed by Oscar Giannino is sort of leaning in that direction. They want to reduce debt, reduce taxes and institute a regime of privatization. Re: national gun confiscation and the danger of it leading to a dictatorship, which I and others are worried about. Now, how long has gun ownership in the U.K. been banned? During that time, have there been fears of a dictatorship developing there? Why has it not yet happened? If it was going to happen, I think it would happen there first because they are further along the road to fascism/socialism/dictatorship than we are. And if it was to happen there, I think that would really spark a revolt over here such that the same would be impossible to accomplish. Just wondering.